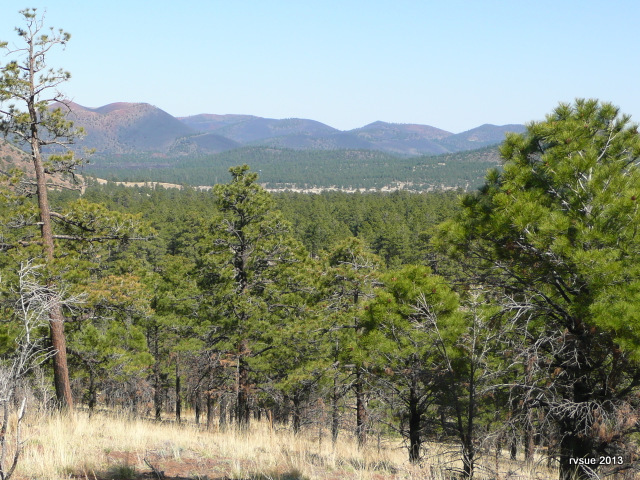 You have several choices where to camp north of Flagstaff, Arizona. 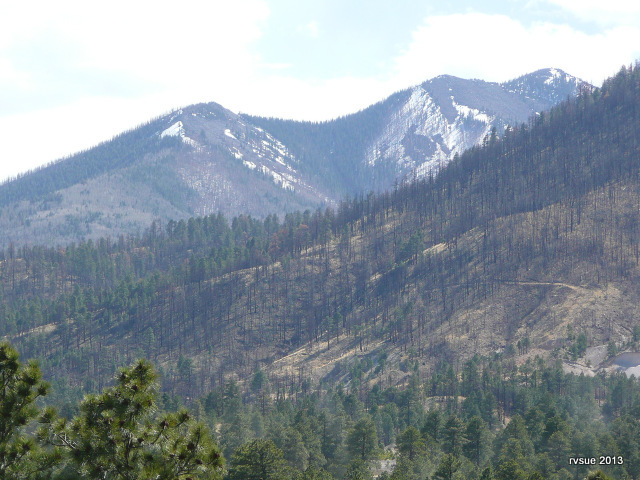 Take Highway 89 north out of Flagstaff. 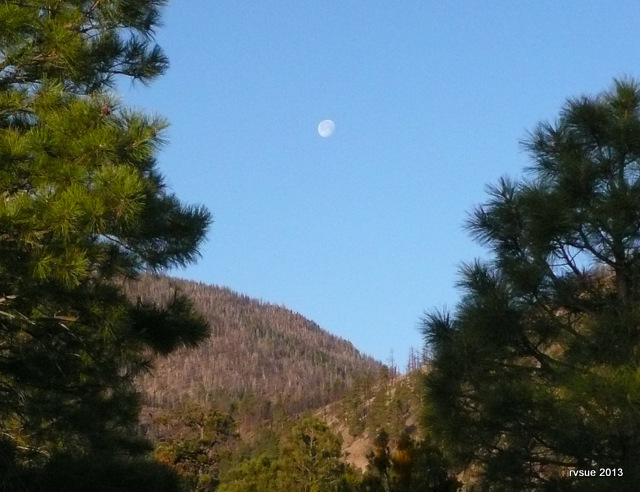 Drive about twelve miles up to Sunset Crater National Monument. 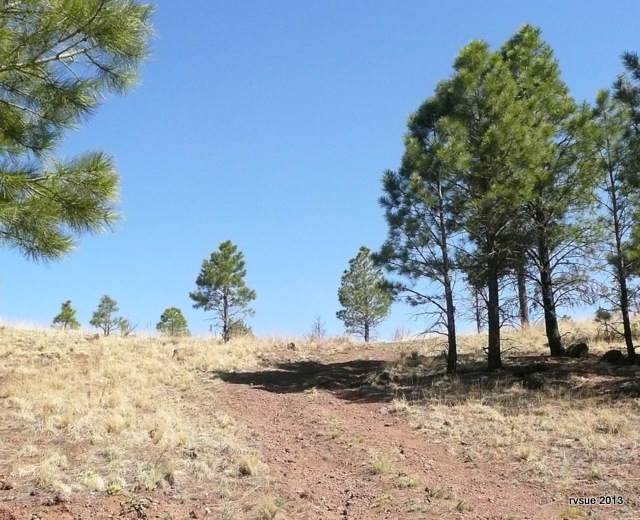 When you come to the Sunset Crater entrance on the right, you’ll also see a sign on the left that reads, “Forest Access.” A turn lane leads you across the divided highway into Coconino National Forest. If you don’t like camping off by yourself, you can turn right instead and go down the road toward the national monument. You’ll come to two campgrounds which require a fee. If you want to camp for free, turn to the left at the forest access. 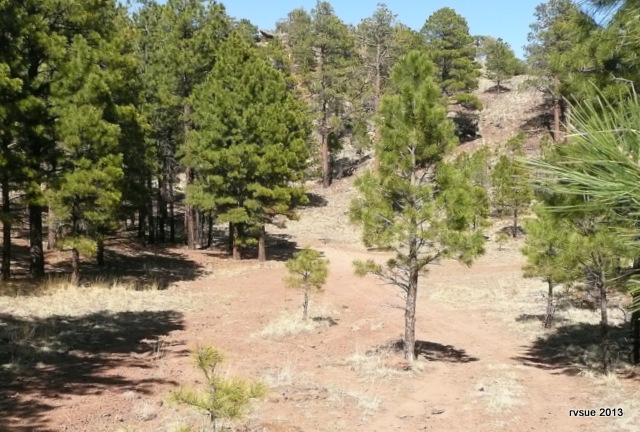 Right away you’ll see some level spots among the pines. These sites are handy to Highway 89 and don’t require driving on a narrow road. Big rigs do fine here. Continue on the wide, dirt road and you come to a sign, “Lockett Meadow.” That’s a campground best for tenters with 4WD. If that’s not you, don’t go that way. Instead, turn right. Follow the road until you come to a fork. Bear right. The national forest post marks the road as #9125F. You’ll quickly arrive at three really nice campsites, each with a view like this. Our campsite is the second one in. What I like is you can’t see anyone camped in the neighboring sites. It’s like they aren’t there. And in our case, no one is there! If you’re daring and have a high clearance rig, you can find more sites further on. 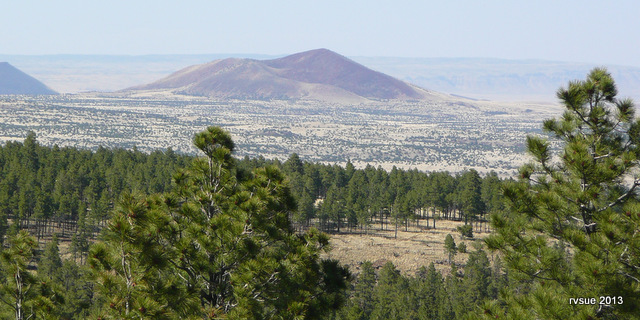 If you ignore the 30-foot rule, you can camp along the ridge and have a panoramic view of the painted desert. The horizon is cloaked with haze beyond the mountains. The crew and I walk some roads we didn’t explore last year. 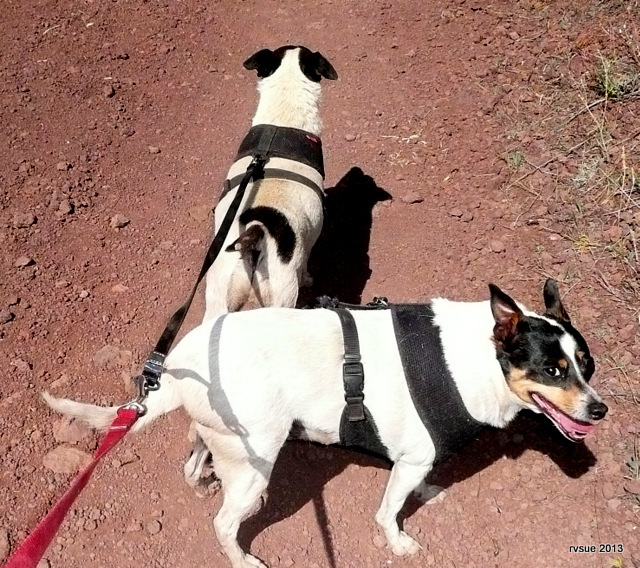 Bridget and Spike are connected so I only have to hold one leash. I like how this area is hill-and-dale. Without tackling a strenuous trail, you can stay on a road which will take you through piney glens and eventually upward where another view awaits you. Usually the crew and I walk in the early morning or late afternoon. I cleaned out the PTV this morning. I’m happy to report that I found very little evidence that rodents had been there. I’m pretty sure they’re gone. I’ve learned my lesson. Trash stays sealed up in a plastic bin! Today we walk at mid-afternoon. Even though it’s a warm day (in the 80s), there’s plenty of cool shade and high, breezy places to rest. 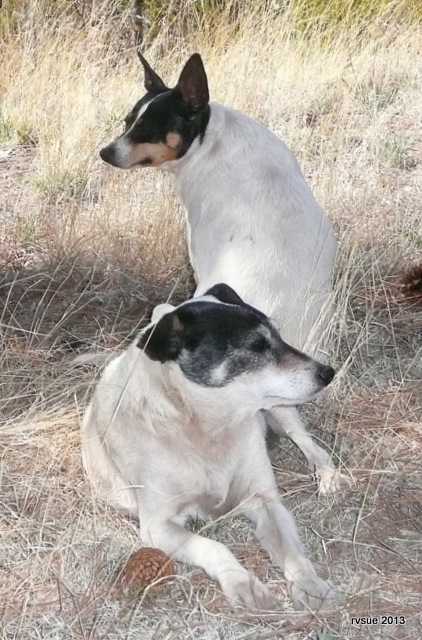 Bridget and Spike enjoy a rest in the shade. Tomorrow we break camp in search of adventure! I hope to make an early start. When crossing flat, desert terrain, it’s best to drive in the morning hours before the wind picks up. The forecast says winds of 17 mph, but that’s usually later in the day. Our drive is only about two hours. We will resume our northward journey on Highway 89. Well, two compass points are covered . . .
We’ll take 160 to the northeast and go through Tuba City and continue to Black Mesa. Then we’ll go north and after about six more miles on 564, we’ll arrive at Navajo National Monument! If I don’t post or reply to comments for a few days, don’t worry. Internet signal is spotty across the Navajo Nation Reservation. You can bet I’ll have lots of photos to share next time I post! Wahoo! We’re on the road again! 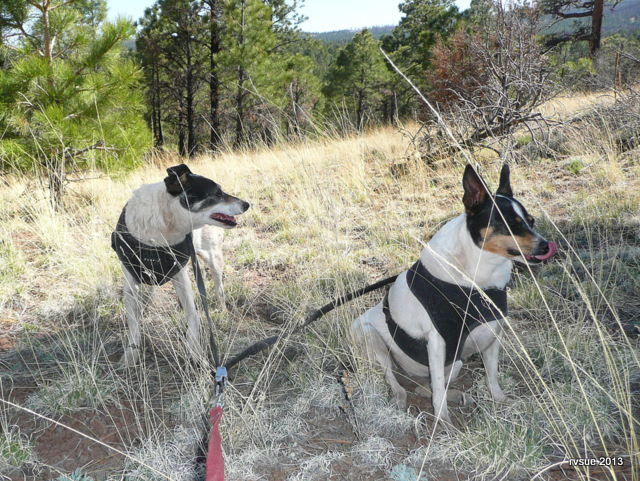 This entry was posted in Simple living and tagged boondocking, camping, casita, Coconino, Flagstaff, free, National Forest, Navajo, rat terriers, Sunset Crater. Bookmark the permalink. I am sure it must have been asked before, but I’m curious as to how you locate the free boondocking camp sites you use. Is there a map source or a special trick to it? Would you kindly share? When you open up the map you will see roads with dots on both sides. Some roads don’t have dots. If there are dots you can camp 300 feet from road. If no dots, it’s 30 feet. There’s also a list of forest roads where camping is allowed. For Bureau of Land Management land, I look at my Benchmark Atlas and search for the hairlike lines on BLM areas that represent small dirt roads. Then I check it out! Hope this makes sense. Nice to hear from you, John. LATER… I forgot to mention that I hear about places from other boondockers, too. Thanks for sharing, Sue. I have often driven across National Forests and wondered just how it was done, locating legal dispersed areas for camping. 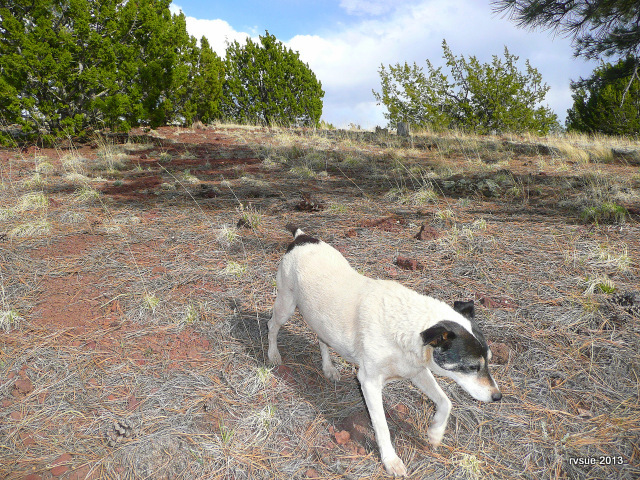 I have even driven carefully down some roads in them, Casita in tow, looking for an obvious camping spot without knowing quite what to look for, all the while wondering just how one knew whether it was legal wherever I was. Some times I just parked and spent a night and took a chance. Sometimes i didn’t. I enjoy your blog immensely. You’re welcome,John. Once you’ve done a little research like I explained, look for places along the forest road where others have camped. Usually you’ll see a fire ring. One more thing, John. If you drop by the Forest Service office (M-F) or BLM office, you’ll get a lot of information and hard copy maps showing where to camp ($). The people in these offices are very helpful. The Bridge is asleep right now. When I go to bed I hug her all night long! I love the peaks in the spring. These photos remind me of chilhood trips to Flagstaff to pick up my sisters who were in college. 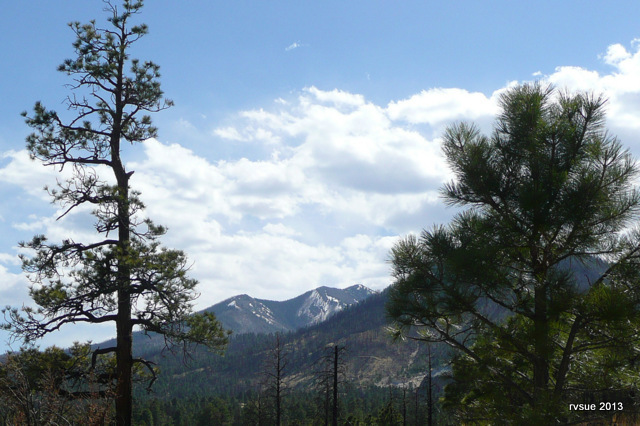 I was raised in Yuma and was always excited to “make the climb” to see mountains and pines. Where are you headed after crossing the res? We’re on our way to Bluff, Utah to explore the area… Gooseneck, Valley of the Gods, Trail of the Ancients, maybe boondock along the San Juan, camp at . . . hey, I’m giving it all away! Now that’s the kind of camping we’re talkin’ about! 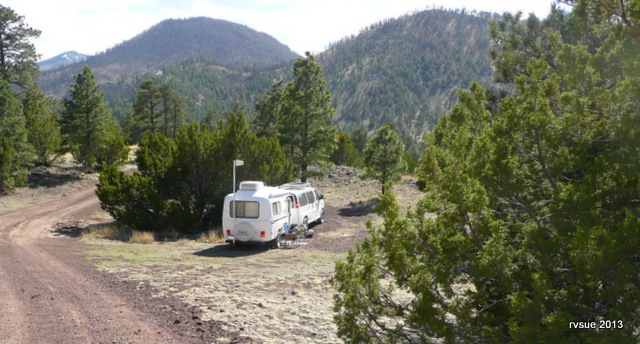 Can’t wait to try out our boondocking skills in Arizona next year! I know you will be successful boondocking Arizona. I’m so spoiled. If I camp where there’s evidence of human intervention, I’m disappointed. 🙂 Keep it wild! Thanks for sharing these boondock sites along with photos. This past winter we did more State Parks than boondock and the plan next winter is more boondock. Safe travels and hope you enjoy the scenery as much as we did. You’re welcome, Ingrid. I know some boondockers think one should keep special places secret. I don’t own these places. . . They’re for everyone. And if I come back and find a spot filled, I’ll go find another one. I like state parks on occasion. Especially ones that have showers! Leaving paradise already? I didn’t know AZ was so wooded, if that’s a word. Wherever you end up…I’m sure it will be gorgeous. And how much is the ticket for exceeding the 30ft rule? The weather spurs me on. Trying to see Utah again before it’s too hot. Yikes Do you actually get out there and measure 30 or 300ft? What a lovely area and the photos are so nice. I think I would like to stay a little longer but then you have been in these parts before. Looking forward to the next camp! Hi Glenda . . . I would stay for two weeks if it weren’t for summer coming along soon in these parts. The crew and I will be crossing Utah on our way to Wyoming, stopping at a national park on the way. We have to move along as Utah can be very hot after Memorial Day. It’s gorgeous there. Glad to hear the rodents are gone. Safe travels to your next spot. Thanks, Ginger. I know there are more gorgeous camps waiting for me and the crew. Wow! Laurie, that’s great! I think that drive through Custer State Park is my favorite. Not only for the wildlife, but the gentle hills with the road winding, such fun to drive. It puts me in a dream state. You’ve really taken off! The RV life suits you well. I know the excitement you feel and the sheer joy at all that lies ahead, waiting to be enjoyed . . .
Once you get the RV and hit the road, the fantastic memories keep piling up! I’m so happy for you. Hark do I see a white furry Spike! He was pink the other day LOL. Bridget seems to be enjoying her walk today. Navajo National Monument is beautiful…we camped there one cold October night. The RVs kept turning their generators on all night which drove me nuts. There were pine nuts all over the place and we picked a coffee can full to roast. We missed the bus that takes you down to the canyon floor to see the ruins…the trails were washed out but we hiked half way down. I told my family RVSue is on the move and I log in every day to see where she and her crew are headed. Safe travels…can’t wait to see the next post. You whet my appetite for tomorrow’s short trip to Navajo National Monument. I’m really looking forward to it! Even with the generators and the missed bus, sounds like you had a good time. Fantastic scenery. Brings back lots of memories of that area. Wish I was there. It’s my pleasure to share it with you, Bill! You’re welcome, Grace. I’m excited to be back in “adventure mode” again! Happy to know you travel with us. I know you have probably answered this at some time but I must have missed it. I think I had some ants in 2011 when I camped in NM. It wasn’t bad. A few ant traps and some spray and they were gone. None since. Maybe that’s because I usually wash dishes outside using a dishpan that’s been filled with water from jugs, so the sink isn’t wet? It was 101 today here in Surprise today, so methinks you picked the right time to go up higher. Travel safe Sue. Hi Crew….. Thanks. I saw that in the forecast. Hope Rusty has gone to higher ground. Try to stay cool, Jim. Hi Sue, I`m curious about you internet service. Do you have a map or something that tells you where you will get service or is it just experince. I want to get connected to wireless internet but I don`t know much about it. No, I don’t use a map or go online or do anything like that. I look at the terrain. Canyons are the worst. When we camped at Burro Creek Rec Area campground (west-central AZ) last spring, the creek and canyon walls with herons nesting were wonderful, but no internet. I had to drive up out of the canyon to post. Sometimes I see the tower on a mountain and know the signal will be good. When considering a camp and unsure about signal, I check my air card before setting up camp. The Wilson antenna mounted high helps a lot. Here at Sunset Crater Camp I got one bar without the antenna, three bars with the antenna. (Hill all around and the camp is in a dell.) However, the connection drops frequently for no apparent reason. So basically it comes down to trial and error and experience. A dell, a dell????? I thought Adele was a singer….. is there a farmer in the dell????? Seriously Sue, great spot and an great explination on your campsite location system! The Benchmarks’ are great! Art Show at the FIESTA weekend in honor of Ralph Edwards who got the name changed to Truthor Consequences and Geri will be buzy selling all her southwest art and photos. We should have the MotherShip ready to go after that! Here to Datil Wells, Lyman Lake,Canyon de Chelly to Bluff. Hi Bridget! It’s nice to see you! Spike, get ready, it sounds like your Chauffer is getting closer to those watering holes you enjoy. Sue, you sure do find some beautiful places to camp. The RV has had all the “shop” stuff done, now… I get to clean it up and shampoo the carpet and start loading it. Rowdy has enjoyed the last couple days in the back yard. He had all of his toys outside by the time I woke up at 7AM. I’ve been thinking that doggie door might not have been such a good idea after all. Enjoy the Res… be careful too. Thanks, Kay. Your Rowdy gives you something to laugh about as soon as you get out of bed! Yeah! Folks are asking questions that I have had…..I’m just gonna’ wait for Sue’s answers. Love the fact that you just “keep on keepin’ on……. Hi, Joan… I have to keep on keepin’ on to see all I want to see! Safe travels, Sue & crew!! We are hoping that we can catch up with you one of these days… We are in Paris Texas heading northwest love following your blog always puts a smile on my face. Awesome views! I look forward to seeing it in person someday. Love you pics of that area … I was there a couple of years ago. Just wondering … when you go off on these BLM type roads, do you ever find that you need 4 wheel drive (which I don’t have) or does your Benchmark Atlas warn you in advance? STUNNING….you captured the land with such glorious views! I can’t wait to see it live!! See your marking on the photos rvuse 2013…how do you do that … a specific program? And how do you create your videos to use with WordPress? As for par I’m full of questions :O) No house sale here yet but we are planning a week up to SD from IL towards the end of May to seal the deal with the driver’s license. Our first chance trying out CozybeGone on the open road…maybe that will get my happy back and maybe the house will sell while we are gone! I mean’t to tell you…that RoadPro we brought from your site is the best purchase ever. My husband goes on and on about it! Haven’t even left yet and he has used it numerous times on the home front!